Shawarma is prepared by cooking meat upright. In many restaurants, they also use yogurt. This recipe does not require complicated cooking methods and is kosher. Cut the chicken into strips and combine with spice mixture. Mix well to coat evenly then refrigerate for 1 hour. Fry the onions and peppers in 2 tbl olive oil until just brown. Combine the tahina, 3 tbl. lemon juice, salt and and 1 tbl. olive oil and mix well. Consistency should be a little thin and taste of lemon juice. 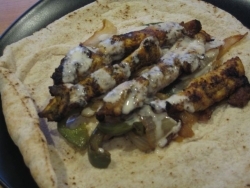 To make the sandwich, add chicken, peppers and onions to a lightly toasted pita, drizzle with tahina, roll it up and enjoy! This is a simple recipe to make and it comes out great! it was sooooooo good and it is not an opinion because i am a scientist and e found out that 99 persent of the would loves this recipe!!!!!!!!!!!!!!!!! !